Rama Loves Seetha song promo will be released tomorrow i.e., on Jan 6th at 4 pm. Ram Charan and Kiara Adwani statrrer Vinaya Vidheya Rama's trailer and songs are already trending in social media. 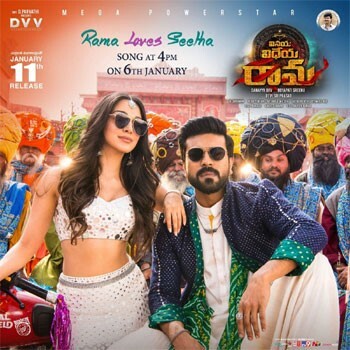 The film is expected to rule the box office with Boyapati's mass dialogues and Ram Charan's dances and actions scenes. The film has finished sensor part and received U/A certificate in spite of the bloodshed scenes. Ram Charan is looking terrific in the released posters with his Rambo look.